Thanks for choosing the Rotary PlayGarden for your celebration! Reservation proceeds benefit PlayGarden operations and maintenance. Please review the information below and follow the link to make your reservation via our Reservation Calendar. Group areas are available for reservation on a first-come, first-serve basis according to the schedule below. Please review the Reservation Calendar for availability and to complete your booking. Available times are displayed in orange. Reservations are accepted online only via our Reservation Calendar. Available times are displayed in orange. Reservations must be paid in full at time of booking. We accept Visa, MasterCard, or American Express for payment. Amphitheater and Picnic Celebrations cost $125 for two hours. Can I book for longer than two hours? Yes, provided the reservation time is available, simply complete an additional booking. You are welcome to stay and play after your reserved time expires, but please clear the group area to accommodate other guests. When must I book my reservation by? Amphitheater and Picnic Celebrations require 3 days advance notice. Can I barbeque in the PlayGarden? Open flames (including barbeques and Sterno-type fuel canisters) are not permitted in the PlayGarden. 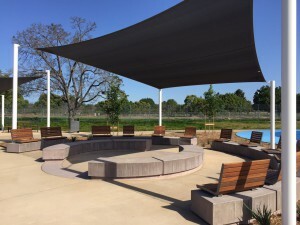 If you are interested in barbequing, please consider reserving the Rose Garden Picnic Area between the Historic Orchard and Heritage Rose Garden. Can I bring a pop-up canopy, extra tables, chairs? 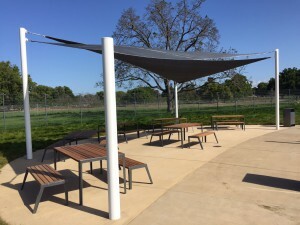 We cannot accommodate pop-up canopies or umbrellas that require staking. You are welcome to bring additional tables and chairs, however, you must reserve an area that is large enough and fits your group’s needs. Lawn areas adjacent to reservable picnic sites are open to the public and are available first-come, first-served. You may not take over a lawn area or reserve a site that is too small for your group and compensate by bringing extra tables. Two six-foot folding tables are provided for your use in the Amphitheater. What items can I bring into the PlayGarden for my celebration? Please note that the following are not permitted in the PlayGarden: open flames (including barbeques and fuel canisters), inflatables, balloons, piñatas, glass, paint, chalk, dogs, bikes, skates, skateboards, and scooters. Balloons are prohibited due to the PlayGarden’s location in the flight path of the airport, as well as in the interest of minimizing litter, protecting wildlife, and in consideration of guests with allergies to latex. You are welcome to bring in prepared food, drink (non-alcoholic; cans or plastic bottles only), and decorations (excluding the items listed above). Please note that we cannot store any items. Only decorations that can be held up with removable painter’s-type tape are permitted. Help us keep the PlayGarden clean and safe by removing anything you bring into the park. Can I play music or amplified sound? No amplified sound is permitted, but if you keep the volume reasonable you can bring a small battery-powered boom box or a bluetooth speaker, but nothing larger. Can I hire a food and/or entertainment vendor? Please note that we cannot accommodate hired food and/or entertainment vendors. Picnic areas are available for set up beginning one half-hour prior to the reservation. Is there a fee for parking? Is there designated parking for the party host? Parking is available free-of-charge. The party host may use the loading zone (to the right as you enter the parking lot) to unload supplies. The vehicle must be moved to a designated parking space after unloading. What are the cancellation and weather policies? • For cancellations 30 calendar days or more prior to the reservation, we will issue a refund less a $10 cancellation fee. • For cancellations 14 to 29 calendar days prior to the reservation, we will issue a refund less a $25 cancellation fee. • We will not issue a refund for cancellations less than 14 calendar days prior to the reservation. • Please be advised that the PlayGarden is an outdoor facility and may be affected by a variety of weather conditions such as rain, wind, and temperature, which should be considered prior to making a reservation. • Inclement weather closes the park. We do not issue refunds due to weather unless the facility closes on the day of the event. We will make every effort to contact you in advance of a weather-related closure. Should the PlayGarden close, we will offer a credit toward a rescheduled date or a refund upon request. • If rain is forecast, parties may reschedule their reservation without additional fees provided they contact GRPC at least three days in advance. If the party chooses to cancel the reservation, the normal refund policy applies. Please email picnic@grpg.org or call 408-298-7657.